Aaaah, brownies... is there a more perfect easy dessert for a crowd?? We went up to my husband's grandparents' place last weekend for relaxing time with family, which we do a few times a year--and I've become known for making rich, grain-free treats for everyone once a trip. My mother-in-law requested something chocolatey, since her mom likes it a lot. I didn't want to yet again make the amazing flourless chocolate cake I've made 3 times now, and I haven't made brownies in literally years, so I thought they would be a great chocolate-ey treat! I don't know about you, but when I think brownies, I think chunky. A brownie without chunks is basically chocolate cake, right? And chocolate cake on its own is not that exciting. 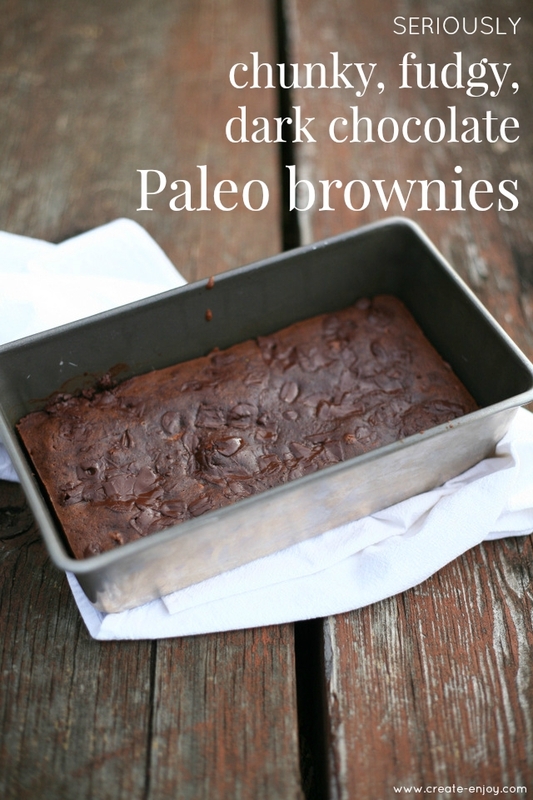 Brownies need to be slightly chewy, definitely dark chocolate-ey, fudgy, and chunky. 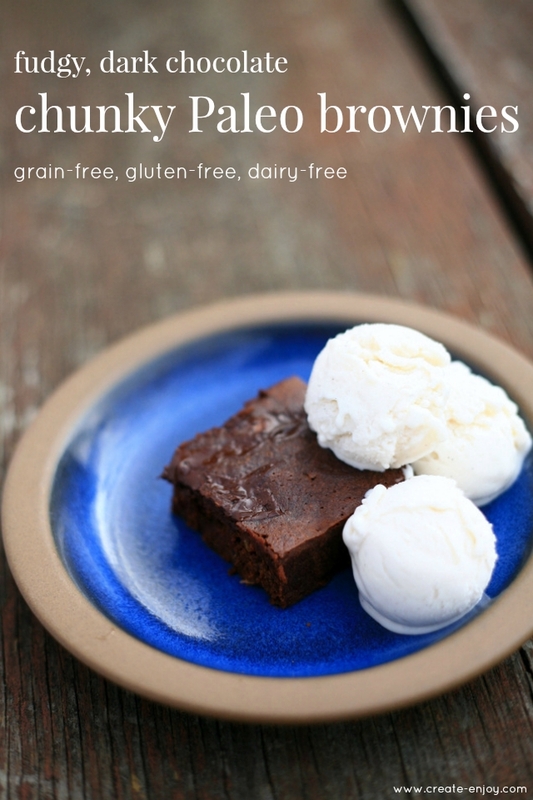 Since I didn't have a go-to grain-free brownie recipe, I dug around and found this recipe, which was almost perfect, except that the only chunky element was the melted chocolate chunks on top--not chunky enough for me! So I looked in my cupboard and fridge and found a few other ingredients to bring for the weekend and try out added to the recipe. Well, they turned out great! This recipe is a keeper, I'll definitely make these again! Plan ahead and get the eggs and coconut oil out of the fridge several hours before making this recipe. If it's cold in your house, you may need to heat the coconut oil and then let it cool a little before using. If it's too cold, it won't blend with everything else. In the bowl of an electric mixer or in a mixing bowl with hand mixer, combine coconut oil, eggs, maple syrup, vanilla, and almond butter; mix on medium speed until well combined. Add cocoa powder and coconut flour; blend on low. Add apricots and walnuts and stir with a wooden spoon or spatula. Pour batter into pan and sprinkle with chocolate chunks. Bake for 15-18 minutes or until firm. Cool; cut into 8 pieces. Optional, but makes them extra special--serve with ice cream! This is storebought coconut milk ice cream.